The Yakutsk extensive air shower array studies cosmic rays of extremely high energies above 10 PeV (=1016 eV), i.e. in the field of cosmic ray astrophysics, an active area at the cutting edge of basic research. The main goals in the construction of this array were: i) the investigation of cascades of elementary particles in atmosphere initiated by primary cosmic rays; ii)reconstruction of astrophysical properties of the primaries – intensity, energy spectrum, mass composition and their origin. When a primary energetic particle reaches Earth’s atmosphere, it collides with a nucleus, producing secondary particles, which share the original primary particle’s energy. These secondaries successively create new generations of particles, i.e. extensive air shower, which arrives at ground level as billions of energetic particles extending over tens of square kilometers (schematically illustrated in figure). One method to detect such a shower is to create an array of particle detectors on the ground. That is the case of the Yakutsk array. Other methods are used by the Fly’s Eye detector group, Pierre Auger observatory, etc. In our case charged particles are detected by scintillators on the ground, muons are detected by scintillators shielded with soil layer, and Cherenkov light emitted in air by relativistic electrons is observed by photomultiplier tubes (PMT). Coincident signals from detectors are shower indicators. 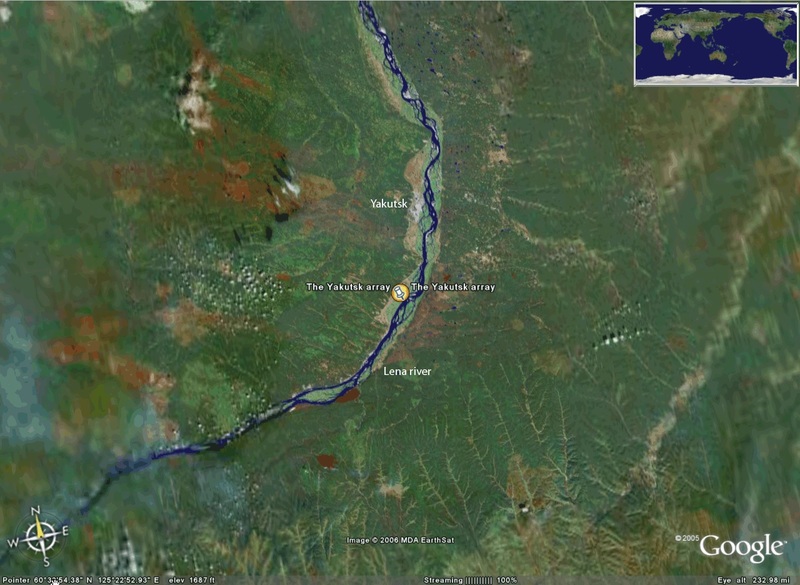 The Yakutsk array is located in Lena river valley near village Oktyomtsy (50 km South-West of Yakutsk). Geographical coordinates of the array are: latitude 61.70 N, longitude 129.40 E, 100 m above sea level (1020 g/cm2), the Earth’s magnetic field is 0.6 G with a dip angle 140. During more than 30 years of lifetime the array has been re-configured several times, the total area covered by detectors was maximal about 1990 (~17 km2, a scheme of the array is given), now it is ~10 km2. In the central part of the array there is a denser domain (shown in a square) with 100-250 m detector spacing. On the whole, approximately 106 showers of the primary energy above 30 PeV are detected; three events have energies above 100 EeV (=1020 eV), having axes within array area and zenith angle below 600. The highest energy event has been detected 18.02.2004 with energy approximately 140 EeV. Green circles are charged particle detectors. Red circles indicate the Cherenkov light detectors – PMTs of 176 cm2 and 3´176 cm2 acceptance area, forming a medium subset with ~500 m spacing. There are additional PMTs of autonomous array subset with independent trigger (50 to 200 m spacing). This subset was added in 1995 with the aim to study air showers in the energy range 1 PeV to 0.1 EeV using the Cherenkov light measurements. Muon detectors are shown by squares.